This kit lifts the rear of your Chevy or GMC truck by 3" and comes with longer u-bolts. 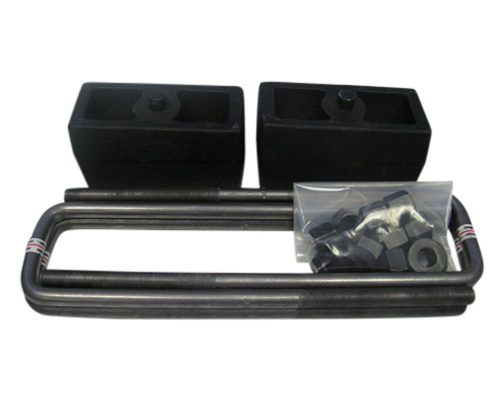 The 3" tapered blocks are a great way to lift the rear of your truck for towing or hauling. The blocks are 3" tall (tapered) and 2.5" wide. The u-bolts are 12.5" long by 2.5" wide and have a square bend. Some dually trucks come with u-bolts that are longer. Be sure to measure your u-bolts before you order, to ensure proper fitment. This kit is designed for Chevy 8-LUG trucks with a 2.5" wide rear leaf spring.